Recording: #AllAccessSAP Xcelsius SOD Update & 2013 SAP BI Roadmap & Stats! We first want to say thanks for attending our final #AllAccessSAP webinar of 2012. Unlike our past webinars, we did something a bit different this time. We issued a survey to our audience asking them ‘What’ they wanted to hear about and from ‘Who’. We were astonished to receive over 2,200+ votes (see details below). NOTE: This webinar was 120 minutes long but due to issues with gotowebinar we only were able to post the first 60 minutes. This unfortunately chopped off the ending where we had BI Community members check in from over 5 different countries including the Middle East, South America, USA, Canada, and Australia. What a great way to end the year! Sit back, relax and listen…. As we enter 2013 we are planning to do these webinars on a quarterly basis, and also rebrand it to be part of our new BI Community by Jan 31st 2013. So stay tuned! We look forward to bringing you more good info! Mico Yuk is a SAP Mentor Alumni and SAP BI Influencer, co-founder of Benchmarkers Business Intelligence and founder of the Xcelsius Gurus Network, the Everything Xcelsius blog. To learn more about her, please visit her about page. 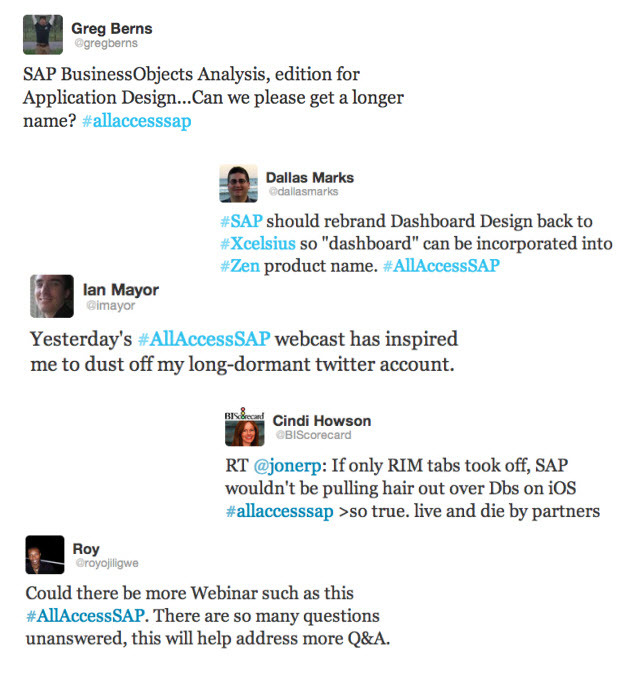 Receiving an astonishing 2K+ votes, we made this the last AllAccessSAP webinar of 2012! For the first time ever we’ve gathered all three of the SAP BI Product Managers in one place to have a NO BS discussion covering the most voted on topics from the survey. Special Guests: Check in with SAP community members around the world on the state of their BI! Xcelsius HTML5 the right route? END GOAL: Provide clear unbiased answers on these ‘touchy’ subjects so that you can enter 2013 with a clear roadmap on what is best for your organization. The #AllAccessSAP webinars are famous for producing breaking news and having quite an engaging audience discussion. Join us! Not able to attend the live session? No worries… Register to receive the recording! Mico Yuk is a SAP Mentor Alumni and BI Influencer, co-founder of Benchmarkers Business Intelligence and founder of the Xcelsius Gurus Network, the Everything Xcelsius blog and BI Dashboard Formula. To learn more about her, please visit her about page. If you have used, invested or are curious about the Xcelsius software, this may the be most important email you will read in 2012! It’s been a LOOONGG, SLOW year in the Xcelsius world, but I’m sure most of you have seen or heard the buzz about the upcoming “All Access Xcelsius” Webinar tomorrow (4/18/12) at 10am PST/ 1p EST that I will be hosting along with the SAP BI Team. If you recall, SAP promised to give us the long awaited ‘Xcelsius Statement of Direction’ back in Jan of 2012. To date we have seen NULL. This call is to follow up on that request and get your future of Xcelsius questions answered. NEW Call Format - Unlike traditional webinars, where SAP typically whips out a PPT for 45 mins, tells you all the good things they hope to come and then leave 10 mins for questions, we will have 15 mins of PPT and 40 mins of questions. Expect most of the questions entered in the registration form to be answered at this time. 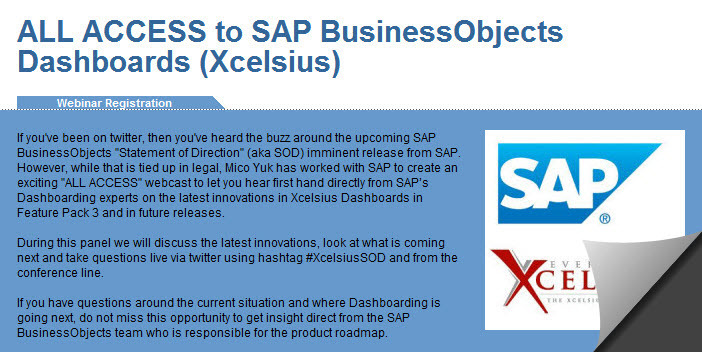 We will also be taking questions via Twitter and monitoring the Hashtags #AllAccessSAP or #XcelsiusSOD. Panel.. the whole SAP BI team! - This usually exists at conferences, and to be honest as the registration numbers started increasing to alarming heights SAP just kept adding team members. GO COMMUNITY. Let’s keep them on their toes! Guess no one wants to be the naked emperor. Live Polls – During the call we want to give SAP as much feedback as possible, so we will be hosting a few live polls on the call and showing the results in real time. Post Surveys – It is also critical that you fill out the post webinar survey that will feature some questions that SAP needs to gain feedback on to ensure that we continue to gain updates. Snuck into there, we will also ask what you would like to see happen with EverythingXcelsius.com in 2012. Continuity.. Lets do it again! - Now note, because of the overwhelming response SAP is already considering doing this same kind of No BS webinar for other areas and tools such as WebI etc. Please be sure again to fill out the post survey if you want this repeated. 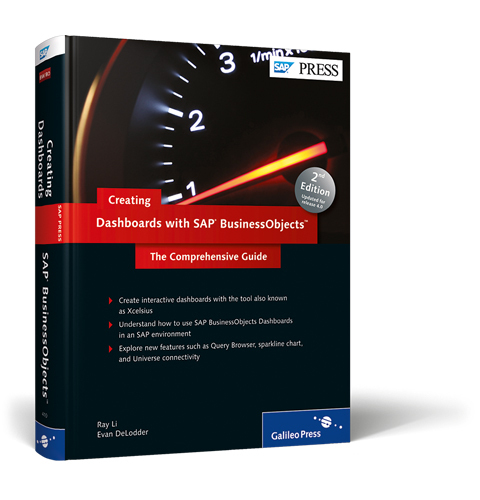 Three Xcelsius Book Giveaways – As a thank you for your support our friends at SAP Press provided 3 of the NEW Creating Dashboards with SAP BusinessObjects (2nd ed.) books to raffle on the call. You Must be present to WIN. 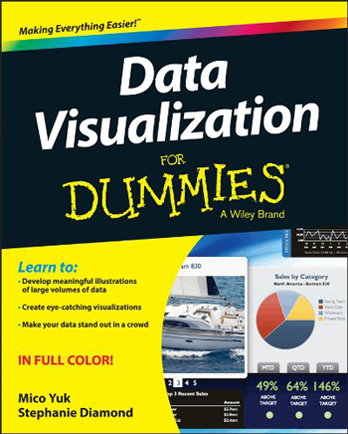 I personally wrote the foreword for this book and it is the only book that will give you clear guidance on how to use Xcelsius in an Enterprise environment. Don’t miss out! Registration Link: You can register using this link: http://bit.ly/XcelsiusSOD. Even if you can’t make the actual webinar, we encourage you to sign up to receive the recording afterwards. We asked the community to come out and support us, and the response is overwhelming! At 100 registrants per day globally, we have over 750+ registrants and counting. As the global evangelist for this product, I just want to say your response makes my 2nd (unpaid) job worth the while. THANK YOU! Don’t forget, even if you can’t make the webinar, still sign up to receive the recording afterwards: http://bit.ly/XcelsiusSOD. PS – Sorry that I have not been blogging as much. It’s very challenging working a day job, dealing with SAP on the back end to keep things moving, being on twitter trying to gain real time responses, and blogging. I do have lots to say and will work on getting this going soon. Meanwhile I would appreciate if you could let me know what you want to see on EverythingXcelsius.com in 2012. Thanks! Mico Yuk is a SAP Mentor and Influencer, founder of the Xcelsius Gurus Network, the Everything Xcelsius blog, and co-founder of Benchmarkers Business Intelligence. To learn more about her, please visit her about page.